Find out more about the elite women and men running in this year's London Marathon. 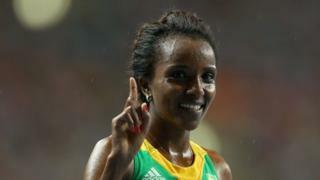 Ethiopia's triple Olympic gold medallist Tirunesh Dibaba will make her long-awaited marathon debut alongside Ethiopian trio Florence Kiplagat, Edna Kiplagat and defending champion Priscah Jeptoo. In the men's field, Mo Farah will face four of the 10 fastest marathon runners in history, including reigning Olympic and world champion Stephen Kiprotich.